As a 11th / 12th dimensional star nation, Lyra can be considered as the most evolved star civilisation of the first sector of the Milky Way Galaxy (read post of 8th July 2014 Introducing Galactic Federation of Light for message on organisation of our galaxy). The genetic imprint of Lyra has been embedded in the human divine blueprint. Numbers, as with other metaphysical symbols, can serve as a memory trigger. When we come across the number ‘12‘ (and to a lesser extent ’11’), a doorway opens in our subconscious mind to connect us energetically with Lyra. Such a catalytic effect is greatly enhanced when the number is associated by masses of people at one time, such as dates used on the calendar. Essentially, what’s been decoded by the Lyra Council of 12.12 is a gateway to their world – by utilising the simple geometry of the Octagon. 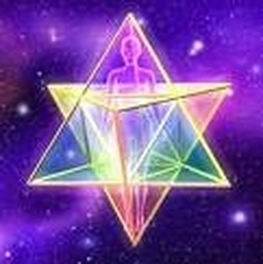 In quiet meditative state, visualise and energise your star tetrahedron Merkabah. See diagram below. This is the geometric pattern of the human energy field in its natural state. It is also used as a astral travel vehicle in meditations. Such a wonderful and timely full moon gift from the Lyra Council. Enjoy your visit to Lyra!